After I added a professional tangent normal mapping algorithm to bake your textures with the best quality as possible using the ZGametools Texturer Toolset. 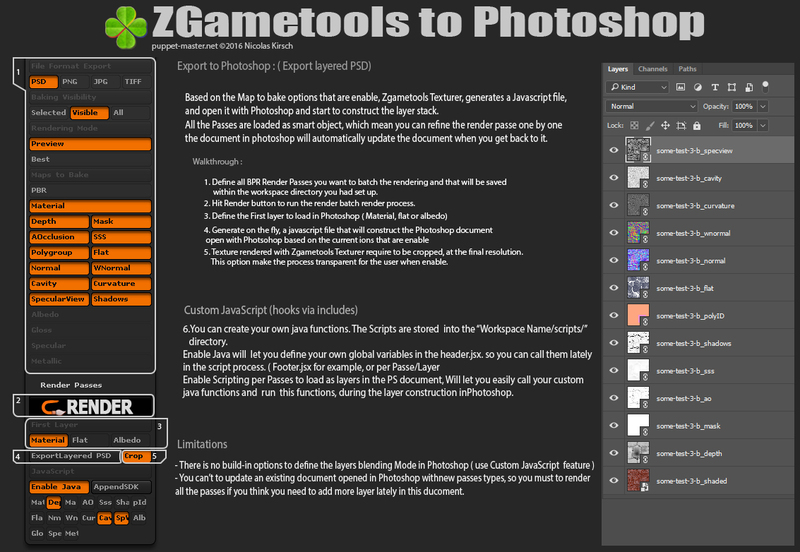 I wondered to myself what would be the best feature that all pro would like to get to complete the workflow in ZGametools. The feature is available at the moment in ZGametools Texturer and ZGametools Renderer, And soon for ZGametools Baker but i must to complete the support of Substance BatchTools before. Like it was on my priority list, and the architecture of the ZGametools that got a complete Project Workspace Manager would match ideally to organize such of new tools. The architecture of the script generation you create from Zbrush , has been thought to be entirely hooked the most simply as possible. Insanely easy to edit and to add news actions you would like to automate during the document construction process in Photoshop. All my Toolsets are Coded with love for Artists.